PONDS UP TO 10,000 GALLONS. kIT CONTAINS: HK-80 AIR PUMP THAT DELIVERS 86 LPM:30' WEIGHTED AIR LINE.WEIGHTED BASE WITH 2] 9" AIR DISKS, FILTTING, CLAMPS. 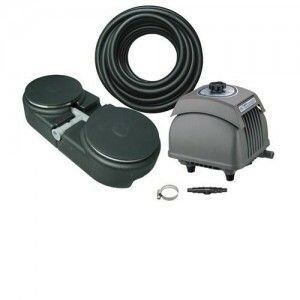 EZ Air Kits are the EZ solution to add aeration to your pond. The MEA10,000 Kit is good for ponds up to 10,000 gallons. If you have a heavy fish load choose the next size larger. The MEA 10,000 Kit includes a Matala air pump HK80L, with a maximum air flow of 100 liters per minute or 3.5 cubic feet per minute. The kit comes with 30 feet of 1/2" black weighted air tubing which does not kink or crush and will stay weighted to the floor of the pond. The kit also includes the MDB22 Weighted Air Base with two 9 inch Rubber Membrane Diffuser Discs which do not exert back pressure on the system so you have the most efficient use of the air flow. All connectors are included to make the installation EZ. Use standard Hakko diaphragm kits and magnets to rebuild Matala EZ Air Pumps.